Faced with a Tweeter-in-chief, how are investors to navigate what’s ahead? 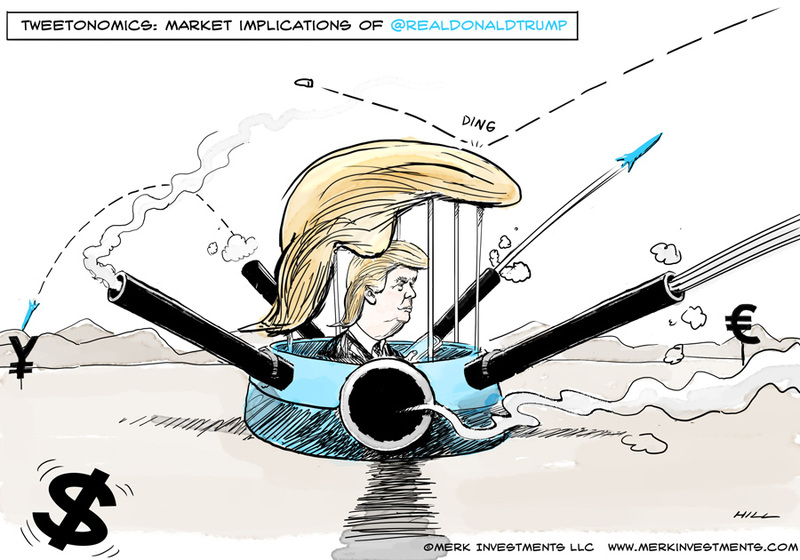 Is there a strategy behind President Trump’s outbursts; and if so, how shall investors position themselves to protect their portfolios or profit from it? With all the outrage about Trump’s style, we have all seen equity markets rally in the aftermath of the election. Is the rally due to investors loving the policies proposed in Trumps’ tweets? We argue no, if only because one can hardly call most of his tweet storms policy proposals. Get multiple perspectives. That means, embrace news outlets that disagree with your political views. If that’s too unbearable, at least follow journalists of those outlets on Twitter that write coherently, even if you disagree with their views. Get an outside perspective by reading (or listening to) foreign news services from the UK, Europe (I mention Europe separately from the UK, as news coverage is different on the continent), the Middle East and Asia. What does German chancellor Merkel think of Trump’s recent assault on Germany? Look it up to gauge how the dynamics might unfold. Go to the sources. In our office, we listened to hours of confirmation hearings to get a better handle of what policies the new administration might pursue. We listen to or read speeches of central bankers, policy makers and influencers around the world. News breaks on Twitter. With a Tweeter-in-chief, it’s not a matter of political preference, but one of staying on top of the news to follow @realDonaldTrump (he now tweets under the handle @POTUS as well; Obama’s Twitter handle has been moved to @POTUS44). Following policy makers allows you to stay on top of breaking news. Following influencers allows you to receive close to instantaneous interpretation of the news. On that note, please ensure you follow @AxelMerk. So what have we learned from our Tweeter-in-Chief? Trump says he is a "winner." To defend this brand, he disavows any potential problems. He throws Schwarzenegger under the bus for not-so-great ratings on his first appearance on the Apprentice, so any decline on the program doesn’t reflect badly on him. He cautions Republicans to be careful not to own "Obamacare" when it’s pretty obvious that Trump himself might be "owning" it; the cost of healthcare will continue to rise independent of the healthcare system we will have; as a result, odds are high that there will be lots of unhappy folks. He publicly denounces Paul Ryan’s tax reform proposal as being too complicated (he singled out the concept of a ‘border adjustment tax’), even as his nominee for Treasury Secretary Mnuchin all but admitted that Trump’s tax proposal was written on the back of an envelope (he didn’t quite say that, but he did say that they had a very small staff and that it would take substantially more work). All Presidents have the bully pulpit at their disposal, even as Trump’s use of it may elevate it to new highs (lower it to new lows?). Trump’s nominee for Commerce Secretary stated it succinctly in his nomination hearings: "When you start out with your adversary understanding that he or she is going to have to make concessions, that’s a pretty good background to begin." The Financial Times recently published an OpEd that discusses how Mr. Ross thrived in his career employing this principle. From the article: "The first step in such negotiations is to get everyone to admit to the problem, perhaps even to create an exaggerated sense of it, so that no one thinks it can be ignored until tomorrow." In reality, keep in mind that it is the House that initiates new tax legislation, not the President. Would President Trump really veto a tax bill with a border adjustment tax? To a significant degree, Trump’s success in implementing his agenda may well be directly dependent on how seasoned the politicians are at the other side of the negotiating table. In my view it is no co-incidence that German Chancellor Merkel shrugged off Trump’s recent assault on German trade policies suggesting to wait and see what the actual policies of the new administration will be. She is a battle-proven politician who has dealt with rather eccentric partners in the Eurozone debt crisis (remember Greek finance minister Varoufakis?). But do not under-estimate the power of the bully pulpit: we all "know" that the banks are responsible for the financial crisis, right? While I don’t want to downplay the role financial institutions played, where is the ire at the politicians that put rules and regulations in place that incentivized bad behavior? Politicians own the bully pulpit, not bank CEOs. In that context, it is in my view no coincidence that Facebook CEO Mark Zuckerberg has as this year’s project to travel the country to get to know the people better. With pictures of him with firefighters, farmers and other "regular" people, he either sets the stage for running for President, or he is taking steps to fight the image that Facebook is responsible for fake news, the rise of terrorism or other ills of the world, a perception that might be promoted by the Tweeter-in-chief. The bully pulpit is effective when there’s an overlap of perception and reality. So are Trump’s tweets merely an opening salvo to negotiations? In some ways yes, as we see Trump more like a third party President. Trump may well need to reach across the isle if he wants to have a substantial infrastructure spending program, as there are more than a few budget hawks amongst Republicans that scoff at a trillion dollar infrastructure spending program. Although divided over a ten-year horizon as stipulated, $100 billion a year ain’t what it used to be. More than a few people are scratching their heads about how Trump wants to succeed in replacing Obamacare, as any new rules will require a sixty person majority in the Senate. What is striking to us is the juxtaposition between what at times appears to be off-the-hip shooting by Trump on Twitter and the clear policy path his cabinet nominees have presented in their hearings. Be careful, by the way, not to confuse "clear path" with agreement or disagreement: as an investor, understanding the proposed policy takes priority over one’s own conviction as to what the better policy ought to be. To me, it means Trump delegates. I don’t think he could have built his sprawling empire if he micro-managed. Whereas former President Jimmy Carter at some point managed the schedule for the White House tennis court, Trump is at the other extreme. So much so that he has time to tweet, so much so that he doesn’t listen to each and every security briefing. A common theme in the nomination hearings I listened to has been the importance of clear policies; the importance of consistent policies; and the importance of adhering to agreements. If you aren’t scratching your head on how to reconcile this with Trump’s comments, you aren’t paying attention. Fiscal policy. Trump’s inaugural address built on his campaign and suggested a major infrastructure investment program. If implemented on the backdrop of low unemployment, we see this primarily as inflationary. That said, we wouldn’t be surprised if Congress won’t go along with Trump’s spending priorities; regardless of that, though, expect to see Tweets about great infrastructure projects under way (some of which will likely have been initiated already under the Obama administration). Taxes. As a simple majority is sufficient in Congress to change the tax code, we encourage anyone to study the Ryan tax plan, as he has the opening salvo in the legislative process. And please disregard any analysis that focuses on the reduction in the number of tax brackets - the number of tax brackets are, in my view, completely irrelevant, as to the impact for investors. What is relevant is whether businesses will, as proposed, indeed be able to deduct 100% of their investments in the first year rather than having to amortize them (this may encourage investments); and how that border adjustment tax proposal is going to look when all is said and done. What to look out for here is whether the U.S. tax system is shifting to a territorial one, i.e. where businesses are taxed no longer on their global income, but based on their U.S. income. If so, it may remove the incentive for businesses to move their headquarters abroad. And while many quibble over whether any money that’s going to be repatriated will be used to create jobs, that discussion, in my humble opinion, misses the point: more important is whether artificial barriers to allocate capital are removed, allowing a more efficient allocation of capital. Another detail may have big implications: the Ryan tax plan would no longer allow the deduction of net interest expense; if implemented, it provides a disincentive for leverage (in our assessment, that’s good for financial stability, but a headwind for growth). Trade. Both Trump and his nominees know that imposing 30% trade barriers is counter-productive. That said, a variant of Ryan’s border adjustment tax may well penalize imports and encourage exports. The proposal would no longer allow the deduction of expenses related to imports. If a variant can be devised that withstands scrutiny by the World Trade Organization (WTO), Trump may well claim victory on trade, even if no tariffs are imposed. Defense. While Congress might be reluctant to fully embrace Trump’s appetite for spending on infrastructure, a Republican controlled Congress may be more willing to invest in defense. Importantly, China’s building of artificial islands in the South China Sea was compared to Putin’s annexation of Crimea during the nomination hearings. I mention this because there too the tone is set. I wouldn’t be surprised if those islands will be a priority for the new administration; the argument may well be to contain China before they become too strong. If so, I believe the risk for a trade war resulting from that dispute to be higher than from a more traditional trade negotiation over, say, the NAFTA, agreement (e.g. China retaliating by making life difficult for US tech firms; or by banning grain imports under the disguise of health concerns). Regulation. Finally a world on regulation: one reason why Trump can dismantle many of Obama’s policies is because he governed by re-interpreting regulations without a change in laws. The executive branch has quite a lot of leeway here, and if Trump doesn’t get what he wants in Congress, he may well pursue a similar strategy. We have already seen this with a directive not to enforce aspects of the Affordable Care Act. The problem with governing this way is that it provides uncertainty to businesses: the one thing worse for business than regulation is uncertainty over regulation. A key reason why expectations on real growth rose after the election was, in our assessment, a perception that a unified Congress could pass laws to not only reduce regulation, but to provide clarity that might outlive the administration. To the extent that such optimism is unwarranted, we may well see real growth disappoint expectations. So what does it all mean for investors? To gauge what it all means for investors, keep in mind the backdrop: stocks have appreciated for years, including a post-election rally. Bond yields not long ago reached historic lows. And the dollar index was up four calendar years in a row. So if you are bullish on stocks, keep in mind that stocks might be expensive. If you are bearish on stocks, will bonds provide the refuge even if inflation ticks up? And that dollar, will the greenback really soar? Just as larger firms tend to relatively benefit from more regulation as they have more economies of scale, a reduction in regulation may well benefit smaller firms disproportionally. The Nasdaq companies tend to be more internationally active and, as such, be more vulnerable to retaliation on any policies by other governments. Historically, in the stock market declines we have studied, the Russell 2000 has outperformed the Nasdaq. The reason may be that the Nasdaq has the more popular (and thus pricier) firms. While I believe this may well apply, a caution to this theory: in 2016, the Russell outperformed the Nasdaq already. To protect against a general decline in stocks, one may need to look further. In that context, cash is an option that is often not mentioned. As investors ponder ways to diversify - or even just a rebalancing of portfolios as equities have outperformed other asset classes - keep in mind that equities tend to be more volatile than some alternatives; as such, to be protected in a downturn, one might need to load up quite substantially on alternatives. As an extreme example: to protect a 100% stock portfolio against a broad market downturn, it would really need to go to almost 100% cash if one wanted to avoid the risk of losing any money. As most investors don’t want to do that, investors are looking for diversification, i.e. for investments that have a low correlation. To the extent that one finds such investments, a similar test should be performed though: how much does one need to add to attain the desired diversification? Bonds should prove interesting in 2017. My personal opinion is that we saw historic lows in 2016. However, if stocks were to tumble, wouldn’t bonds rally? Possibly. What I’m concerned about is that bonds will fall for different reasons than in 2016: in late 2016, more real growth was priced in; I happen to believe that some of those higher real growth expectations will be replaced with higher inflation expectations. If that happens, bonds can lose money even if stocks fall. More so, the dollar might not be so shiny after all, if higher inflation is priced in. Fed Chair Yellen recently (at Stanford on January 19) gave a speech in which I interpreted her argument as to suggesting "this time is different" as rising inflationary pressures e.g. in wages are really not as strong as some say. That’s not to say other currencies can’t suffer in a trade war - the Mexican Peso has been particularly vulnerable as the Mexican economy is particularly dependent on exports to the U.S.; China’s currency may also be vulnerable as speculators could increase their attack on the currency should China be pushed into a corner. That said, I am more optimistic on how major currencies will perform versus the greenback, as we may have seen the low in interest rates in much of the world. Last week, European Central Bank President Draghi fought against that perception, but it was a fight in words only which I characterized as "huffing and puffing" to pressure the currency lower - a strategy that worked for a few hours that day. What about gold? As we have indicated in the past, gold may be the "easiest" diversifier. Easy because it’s easier to understand than other investments that might be able to perform well when both stocks and bonds are vulnerable (e.g. a long/short equity or long/short currency strategy). We believe gold is a good diversifier over the medium to long-term, as its long-term correlation to equities, in our analysis, is near zero; that said, the price of gold can have an elevated correlation to either stocks or bonds over shorter periods. If I am right that inflationary pressures will increase, then gold may benefit. If, however, Trump’s policies will foremost boost real growth, gold might suffer. One reason why I am optimistic on gold is that I haven’t seen any proposal to get long term entitlement spending under control which is, in my view, key to long-term fiscal sustainability. The link to gold is that a lack of long-term fiscal sustainability may lead to negative long-term real rates which, in turn, would be a positive for gold which has a cost of holding and doesn’t pay interest. To expand on the discussion, please register for our upcoming Webinar entitled ‘Trump or Dump Gold?’ on Thursday, February 16, to continue the discussion. Also make sure you subscribe to our free Merk Insights, if you haven’t already done so, and follow me at twitter.com/AxelMerk. If you believe this analysis might be of value to your friends, please share it with them.